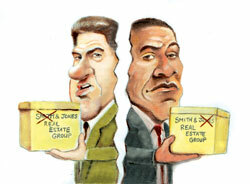 A year ago, teaming up looked like a great idea for real estate agents. Industry-wide, there had been a decade-long trend toward consolidation. Plus, in a bad economy, who wouldn’t want more bodies scouring the city for leads? That was then. Now, a handful of agents are disbanding their teams or shelving plans to form them. They say that the larger coalitions, which are also referred to as “groups,” add too much bureaucracy and risk. They also note that teams can be ploys to boost gross commissions so that agents or brokers can qualify for higher splits with their firms. “It was so time-consuming to train [other members of the team], to make sure everything was fine, instead of just being the street broker that I used to be,” said Terry Naini, a broker with Prudential Douglas Elliman in Brooklyn Heights. In February 2009, frustrated by how tough it was to sell a backlog of properties with just an administrative assistant, Naini brought on four less-experienced agents. But consumed by as much as 20 hours a week in training, which included pointers on style and ethics, Naini broke up the team a year later. In an up market, when the commissions are pouring in, the degree of training a broker has may not matter, since buyers are signing deals without much goading. But when the market turns and more face-to-face interaction is required, a broker with more expertise who can give clients undivided attention is a must, said Darren Sukenik, who also works for Elliman. In 2008, Sukenik, who’s been selling real estate in New York for a decade, jettisoned five agents he had had on his team since 2006, which reduced his team from eight people to three. (The three provide clerical, marketing and scheduling assistance, he said.) As a result of having fewer people to manage, Sukenik’s gross sales were 20 percent higher in 2009 than in the previous year, he noted. The economics of maintaining a team can require a delicate balance. Members typically will get a cut of every deal proportional to what they’ve contributed — a smaller share for the agent who takes clients around than the one who does the heavier lifting of deal negotiation, for example — which obviously can dilute a broker’s total commission. Of course, there can be benefits to being part of a well-oiled team. If, for example, extra salespeople do actually increase sales volume, the added payouts may be justified because the overall pie is bigger, brokers said. Last spring, faced with an overwhelming number of inquiries, John Dolle, a rental agent with Century 21 NY Metro, considered forming a team under a payment structure where he would initially take 60 percent of any commission, with the other 40 percent going to the broker who showed the apartment. And with experience, that same agent could someday graduate to an 80 percent commission, by shepherding the leasing process from start to finish. What worried Dolle, though, was putting leads into the hands of agents who were still wet behind the ears, like many he interviewed over an unsuccessful three-month process. “I didn’t want to send somebody out with just any Joe Schmo” and squander leasing opportunities, he said. For other agents, teams are a no-go because they’re symptomatic of what’s wrong with the way firms rank their highest-producing agents. Indeed, they say, teams are sometimes assembled by more-senior brokers in the interest of jacking up their commission levels to score a larger percentage of pay from their firm, from 60 percent to 70 percent. “They do it so they can be the big cheese,” said Lauren Muss of the Corcoran Group, a 16-year industry veteran who is one of the few brokers to regularly wind up on her firm’s New York top-earner lists without a team. Many teams do offer legitimate benefits, especially when agents’ skill sets can be evenly matched, Muss explained. But fewer agents often means chasing bigger deals. “You can be one of 12 people handling a lot of deals between $500,000 and $1.2 million, or you can be alone handling a few higher-caliber listings between $2 million and $10 million,” she said, referring to deals that experienced brokers know how to cultivate on their own. Plus, Muss said, teams result in a loss of control. Twice in the last four years she tried to put together a team, though ultimately, “you lose track of what’s going on,” she noted, likening the experience to her recent two-month absence from work for knee surgery. Today, Muss operates with a staff of just two: Though one employee is a broker, he does not bring in leads, she said. “It’s more about working for me than with me,” she said. Whether teams are created to make brokers seem more successful than they are, or whether they are actually designed to provide a higher level of service for clients, may be a matter of debate. But what is clear is that teams are still a strong presence in local real estate, despite any backlash against them. Among Halstead Property’s New York brokers, for example, 85 are members of 40 teams. That’s out of 675 agents citywide, making team members 13 percent of the firm’s sales force. Some others are convinced teams are still the way to go. For example: This year, Alan Krevis and Frank Russo of Halstead formed RK Group. In addition, Corcoran’s eight-broker Blumstein Team, which already includes the husband-and-wife duo of Meris and Kenny, as well as daughter Sydney, is adding another family member, son Cole, this month. Why does the concept continue to be appealing? “‘Team’ has a certain panache to it, even if it’s just two people,” because it implies that a broker will never miss an appointment, said Elaine Clayman, a Brown Harris Stevens broker who heads one of the city’s older and larger teams, with 13 people, 10 of whom sell homes. Clayman plans to add more brokers soon, she said. She said delegating duties to what she calls “specialists” — Clayman handles negotiations but usually sends proxies to closings — is the hallmark of any well-run business, even if the costs and hassles can be greater than working alone.